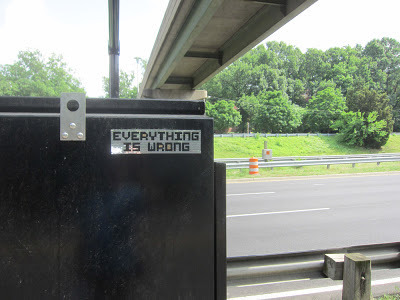 An "everything is wrong" sign has been wrongly installed under Rosslyn's Westmoreland Pedestrian Overpass for Rt. 50. The Virginia Department of Transportation (VDOT) has wrongly installed the nearby digital traffic message sign. A "welcome to DC" sign in Rosslyn is also wrong. However, Elvis appearing at the Rosslyn pit stop for Bike-to-Work Day was profoundly right.